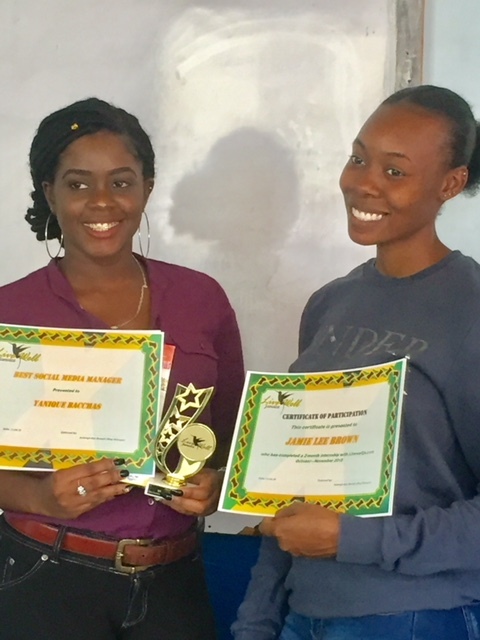 Certificates and special awards for outstanding work were presented to interns who completed the three-month work and training opportunity by blog Manager, Ashleigh-Ann Mowatt. A guest presentation was made to the group by Angela deFreitas, General Manager of CHOICES Career & Education Advice, which collaborated with Live Well Jamaica by offering opportunities. Recognised at the ceremony were Madeline Green, for marketing consultancy, Yanique Bacchas for social media management and Jamie Lee Brown. Live Well Jamaica is a repository of positive, Jamaican stories and encouraging news and information about Jamaica and Jamaicans. PIC (TOP) – Angela deFreitas, General Manager of CHOICES Career & Education Advice (left) shows off the company’s award after receiving it from Live Well Jamaica’s Manager, Ashleigh-Ann-Mowatt. PIC (BOTTOM) – Interns Yanique Bacchas (left) and Jamie Lee Brown with their awards.